Nature Knows Ready-to-Eat, Fresh Fruits & Veggies. All natural, with no preservatives, nut free, & gluten free. Finally, a solution for all ages, to eat well on the go, anytime you need, anywhere you go! In our convenient individual portion size, they are uniquely designed in sustainable formats. 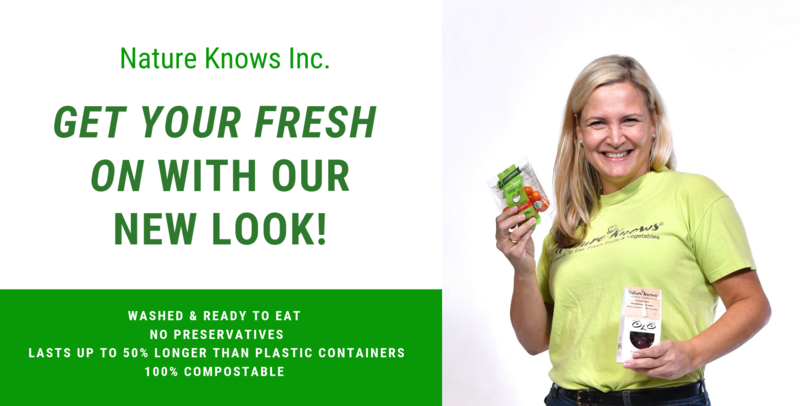 Yes, our NEW compostable pouches go in the green bin! 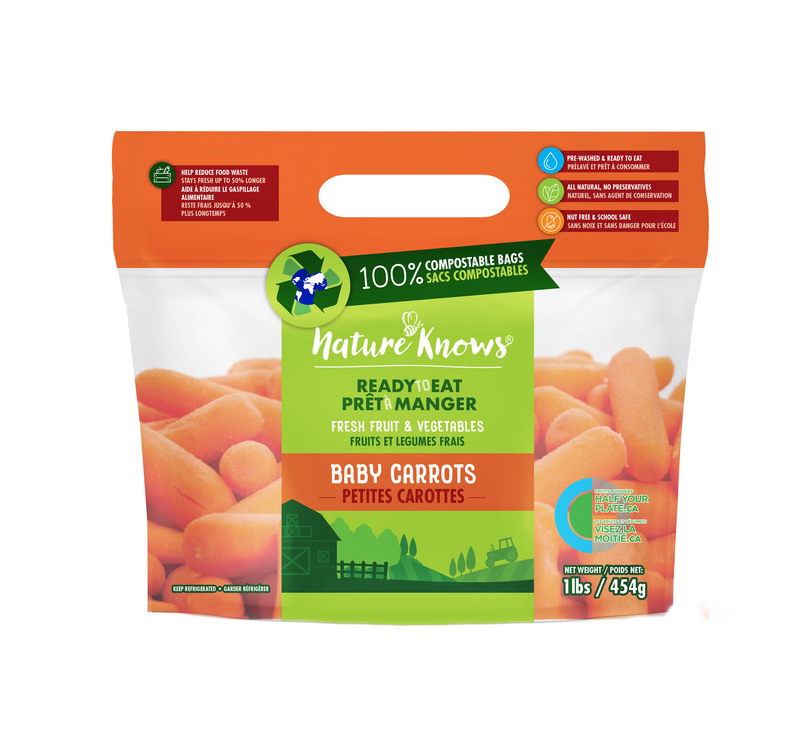 Our newest product is our resealable & compostable Farm to Table Bags! 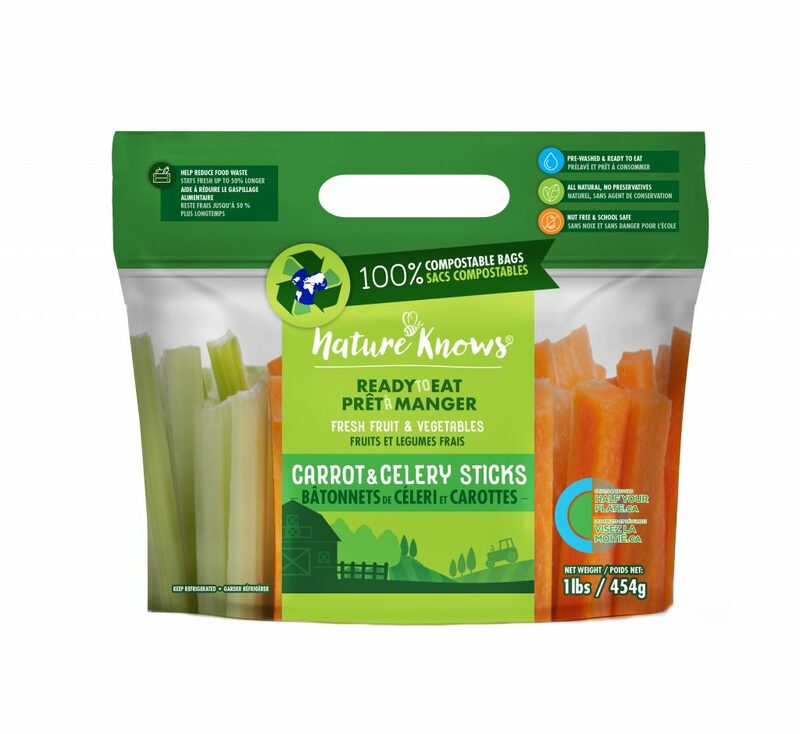 Our produce stays fresh naturally up to 50% longer than plastic formats. Good for us & our planet. There is no waste with our fully washed, dry and sterilization process; Nature Knows produce stays fresh in your fridge for up to 2 weeks. Ask us about our Foodservice, Grocery & Community programs. Our sterilization process keeps foods fresher longer. Our Sterile-Aire’s multi-patented UVC Emitter prevents mold, bacteria, yeast and viruses from contaminating our fresh fruits and vegetables from preparation through to packaging, transportation and storage. Our produce is sourced from as many local farmers and greenhouses as our Canadian growing season allows. We choose farmers and suppliers with the highest quality standards. Our specialized package design with patented features was developed and refined over the course of six years. It was designed with two main goals in mind; to keep food fresh and to not contaminate our precious earth. 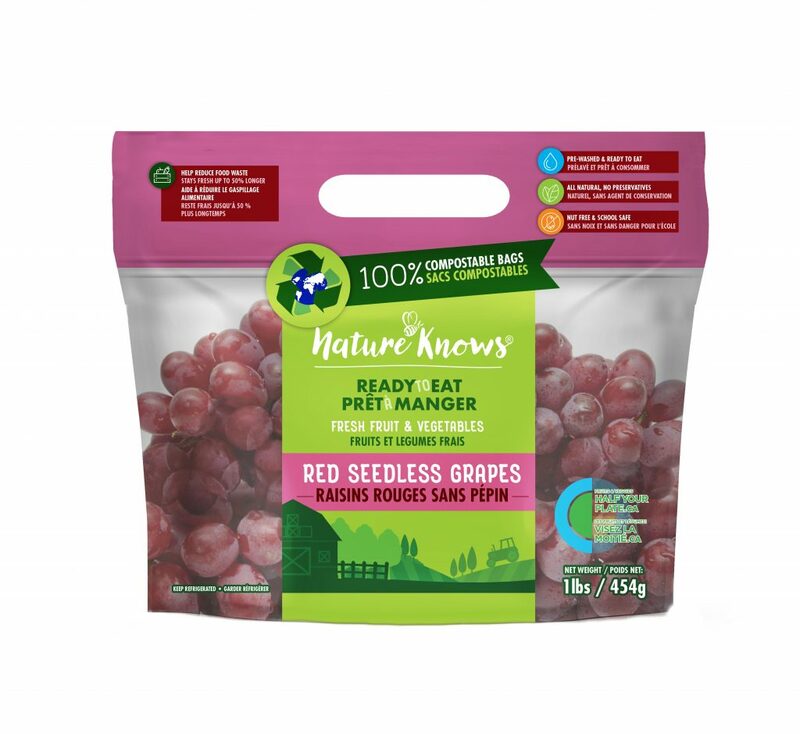 Nature Knows offers their products in convenient Family Farm Bags. 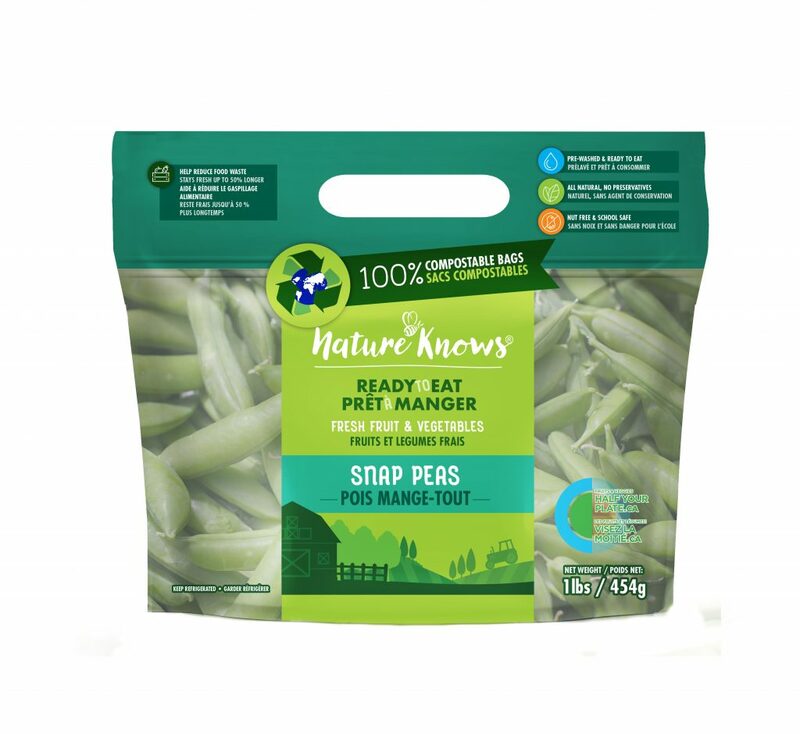 Our “NEW” Farm to Table Bags are resealable & compostable helping to reduce food waste. 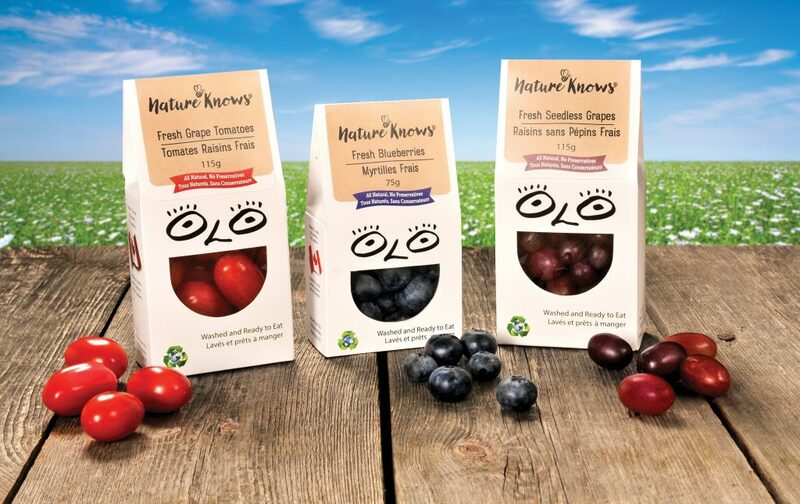 Our produce stays fresh naturally up to 50% longer than plastic formats. An array of hearty fruits and vegetables are available in our unique compostable packaging. Getting Kids Involved in the Kitchen!